Join us and CELEBRATE 3 years of Mural Art Learning Institute programming! From 2016-2018, MURALi has served a vital role in mural education for artists by offering a range of training programs in mural making from introductory programs and practical workshops for artists to professional development for project managers. 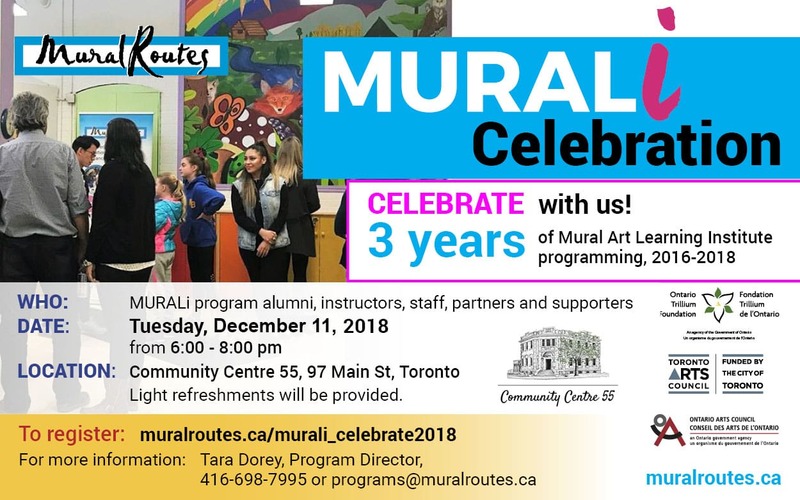 During these years Mural Routes has gained a robust network of emerging and professional artists who have went on to create public art in their own communities and further their mural art careers. We would like to celebrate and thank everyone who has been a part of this process including our many students, instructors, partners and funders Ontario Trillium Foundation, Toronto Arts Council, and Ontario Arts Council. This could not have been done without you! WHO: MURALi program alumni, instructors, staff, partners and supporters.